"Our goal is to make people laugh, then make them think. We also hope to spur people's curiosity, and to raise the question: How do you decide what's important and what's not, and what's real and what's not — in science and everywhere else?" 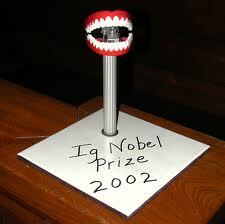 "The Ig Nobel Prizes honor achievements that make people laugh, and then make them think. The winners come to a gala ceremony at Harvard University's Sanders Theatre, and then give public lectures at MIT." Al ver todas las cosas como ratas de laboratorio, los científicos se alejan tanto de la realidad, que pueden ser capaces de romper sus límites hasta llegar al absurdo. Pienso que los investigadores toman a bien los premios, pues es una manera de reirse de si mismos. Outcomes: Performance on the NDRCT was lower in the inappropriate condition than in the others. This supports the authors? hypothesis that inappropriate highlighting would reduce reading comprehension. There was no significant difference in test performance between the control group and the appropriate highlighting group. This supports previous research showing that highlighting of appropriate materials does not interfere with the retention of materials. The study points out that if the participants had actively taken part in the highlighting of appropriate materials, there may have been a significant difference between the Appropriate and Control groups. Follow-up Activities: A second experiment was used to test whether a prior warning would eliminate the negative effect of inappropriate highlighting. The same test and conditions applied to this group. The results show that even with prior warning, participants in the inappropriate group would be unable to ignore the inappropriate highlighting. Cuando uno lee los resultados del trabajo, comprende que estas investigaciones tienen la clara virtud de hacernos reir, pero a la vez nos ponen a pensar, sobre qué es lo importante. Especial, efática y directamente en el caso de este estudio. Contrario a la frase, lo relevante es lo irrelevante, les mando este post de regalo. ¡Ah! Para terminar, pienso que debería ponerme las pilas para que algún día me concedan este honor... ¡delirante! Acá aprovecho para compartirle a los asistentes, las filminas de la presentación: Los números también son sexys. Benchmarking de Fanpages en CR. ¡Provecho!